Khloé Kardashian is ''exhausted'' after cooking this year's Thanksgiving feast, which consisted of over 10 dishes that she had been planning for the past year. Khloé Kardashian is ''exhausted'' after cooking this year's Thanksgiving (23.11.17) feast. The 33-year-old television personality was ''slaving away'' in the kitchen for hours to make 13 different courses, including chicken wings, turkey macaroni cheese as well as cinnamon buns, pumpkin pie and apple pie. But the star has admitted her hard work was well worth it because she loved seeing everyone's reactions to her dishes. And Khloe has revealed she has been planning for the annual celebration for a whole year. Speaking in a post on her website khloewithak.com, she wrote: ''Being in Cleveland, I have to do everything on my own. But I love it and I'm really looking forward to doing it again this year. 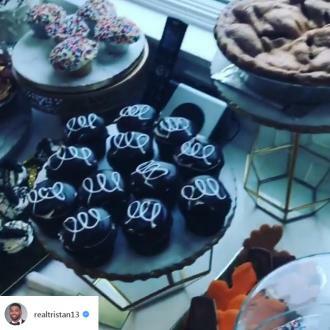 And the former 'Kocktails with Khloe' host's beau, Tristan Thompson, has taken to social media to show off his lover's impressive spread. Alongside a video, which was shared on his Instagram account, he panned around the room to show off the vast amount of food, which included a selection of breads and crackers with grapes and dips, two cheese boards, a fruit platter, a selection of meaty dishes, green beans, as well as cookies, cupcakes, doughnuts, three pies and a huge cake. While the sporting ace is grateful for the food, Khloe is thankful to have Tristan in her life. Meanwhile, Scott Disick - who previously dated Khloe's 38-year-old sister Kourtney Kardashian - is ''thankful'' for his children Mason, seven, Penelope, five, and Reign, two.